This year is the 40th anniversary of The Prince Edward County Community Care for Seniors Association. The organization will celebrate its long history of helping seniors live independently at home at a special event on October 12th, 2017 at Rotary Hall at the Prince Edward County Community Centre. As part of these celebrations, it is profiling some of the many people who have been instrumental in its development. Margaret Werkhoven was born in England as the daughter of a Canadian soldier and his English bride, and the family moved to Canada in 1946. She became a teacher specializing in English, Latin and history courses. She also taught her students about leading a happy and meaningful life. Marg rose through the educational system to become a Vice-Principal and Superintendent of Schools for the Hastings and Prince Edward District School Board. 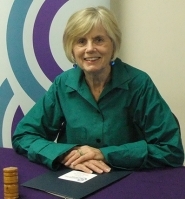 After retiring in 1999, she used her longstanding commitment to volunteer service as a transition into retirement serving as a founding board member of the South East Local Integration Network, a provincial organization funding over 120 regional health services. It was her first opportunity to meet representatives from smaller organizations like The Prince Edward County Community Care for Seniors Association. She became a board member of the organization in 2010 and the President of the agency over the last four years. Marg is also the Chair of The Police Services Board. She is also optimistic about the future of organizations heavily dependent upon older volunteers. While some are experiencing difficulties in attracting new people, she believes the current generation of “Boomers” will drive the need for governments to fund the health services they will require. And she has faith that the next generation will become active volunteers, something she has encouraged in her grandchildren, who both volunteer at the Thrift Shop. Alexa, her 14 – year old granddaughter, enjoys the friendly, supportive atmosphere and is encouraging her friends to become involved. The examples of her grandchildren make Marg optimistic in face of the “grey tsunami” of aging volunteers now affecting many volunteer groups. And she continues to promote the many advantages of volunteerism.